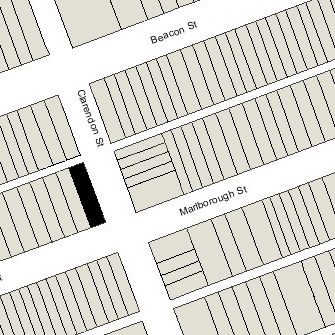 274 Clarendon is located on the NW corner of Clarendon and Marlborough, with 278 Clarendon to the north, across Alley 419, 270 Clarendon to the south, across Marlborough, 273-279 Clarendon to the east, across Clarendon, and 103 Marlborough to the west. 274 Clarendon (101 Marlborough) was designed by Peabody and Stearns, architects, and built ca. 1872 by Weston and Shepard, masons, and Grimes and Murray, carpenters, as the home of Augustus Flagg and his wife, Lucy (Hobbs) Flagg. They previously had lived at 14 Mt. Vernon. They also maintained a home in Waltham. Plans for the house, including floor plans, the north (alley) elevation, and written specifications, are included in the in the Peabody and Stearns Collection in the Boston Public Library’s Arts Department (reference PS/MA.061). Click here to view the floor plans and north elevation. Augustus Flagg purchased the land for 274 Clarendon on July 10, 1871, from Catherine Sanders (Pickman) Fay, the widow of Richard Sullivan Fay. She lived in Lynn and later would live at 312 Dartmouth. She had purchased the land on April 22, 1869, from attorney Francis E. Parker, who had purchased it from the Commonwealth of Massachusetts on November 21, 1865. The land originally was sold by the Commonwealth at its sale on January 3, 1863, and had been under agreement to banker and broker Robert Marion Pratt who, on June 24, 1863, entered into a party wall agreement with Catherine Louisa Hill and Almira H. Hill, owners of the lot at 103 Marlborough, who were about begin construction of their house. Click here for an index to the deeds for 274 Clarendon. Augustus Flagg was a publisher with the firm of Little, Brown & Company. He retired in 1884. The Flaggs’ two daughters — Lucy Hobbs Flagg and Mary Derby Flagg — lived with them. Lucy Flagg married in October of 1889 to George Harmon Doty. 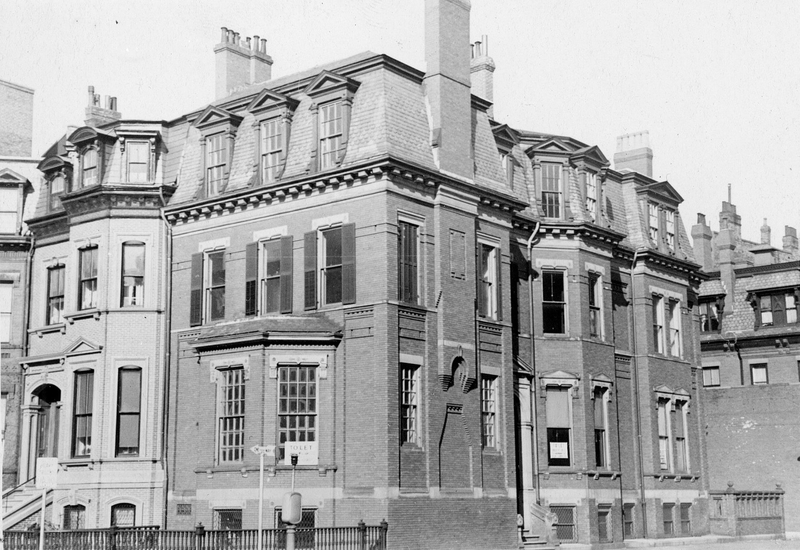 After their marriage, they lived in the Flaggs’ home in Waltham. At the time of their marriage, George Doty was a Lieutenant in the US Navy; after retiring from the Navy, he became a trustee of estates, served on the staff of Massachusetts Governor Curtis Guild, Jr., and was Assistant US Treasurer for Boston. Mary Flagg married in January of 1901 to real estate and insurance agent Henry Niebuhr Richards. 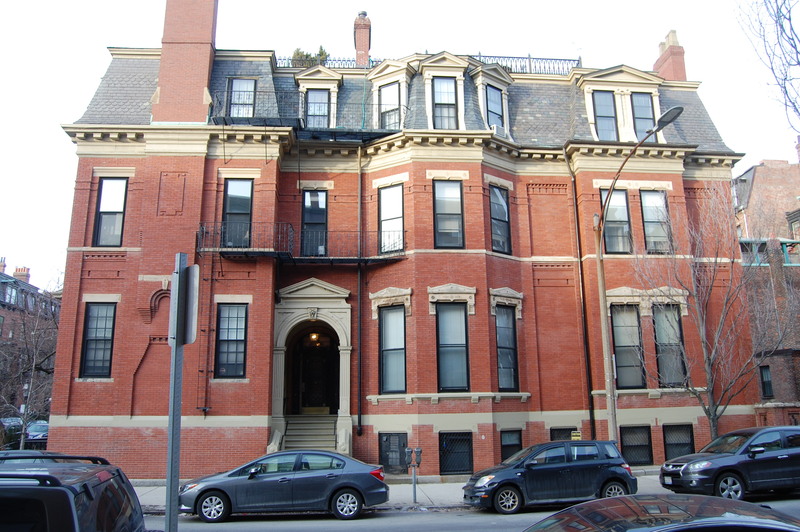 After their marriage, they lived at 103 Marlborough, next door to the Flaggs. Augustus Flagg died in November of 1903. On March 14, 1907, Augustus Flagg’s estate transferred 274 Clarendon to George Doty, Henry Richards, and Solomon Lincoln as trustees for the benefit of Lucy (Hobbs) Flagg. She continued to live there until her death in August of 1919. On January 8, 1920, 274 Clarendon was purchased from Lucy Flagg’s trust by William Endicott. He and his wife, Ellice (Mack) Endicott, made it their home. They rented 301 Berkeley while the house was remodeled, but had moved to their new home by late 1921. They also maintained a home in Prides Crossing. William Endicott was an investment banker with Kidder, Peabody & Company. He remained with the firm for his entire career, retiring in 1929. He also served as president of the Boston & Albany Railroad, and as Chairman of the Board of the New England Trust Company and of the Union Mills. 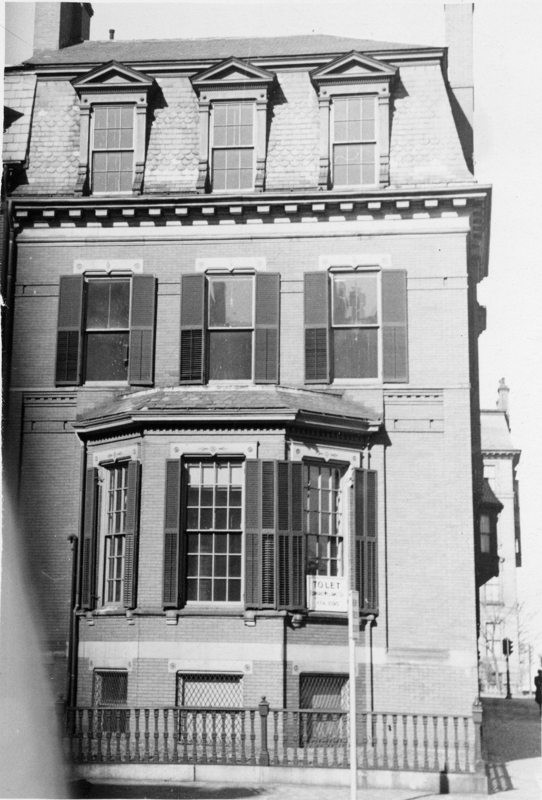 The Endicotts continued to live at 274 Clarendon until his death in August of 1941. The house was shown as vacant in the 1942 Boston City Directory. On January 14, 1942, 274 Clarendon was purchased from Ellice Endicott by Mrs. Lillian (Lydia) F. (Reilly) Clinkard, the former wife of Alfred Harper Clinkard. She lived at 103 Marlborough. In September of 1942, she filed for permission to convert 274 Clarendon from a single-family dwelling into a lodging house. She subsequently abandoned the application. By 1943, 274 Clarendon was the home of Mrs. Alfrietta (Fretta) (Paris) Ellsworth, the widow of attorney George Lovell Ellsworth. She operated it as a lodging house. She previously had lived at 84 Pinckney. She continued to live at 274 Clarendon until about 1947; she was living in the Los Angeles area at the time of her death in September of 1948. In December of 1947, Fred L. Arata, a retail liquor dealer and real estate investor, applied for (and subsequently received) permission to convert the house from a single-family dwelling into ten apartments. It remained the property of Lillian Clinkard but probably was under Fred Arata’s management (he had owned 103 Marlborough when Lillian Clinkard first lived there, and she had acquired it from him in November of 1942). Fred Arata and his wife, Annette Flossie (Crovo) Boggiano Arata, lived in Brighton. On October 27, 1954, Lillian Clinkard transferred both 274 Clarendon and 103 Marlborough to Fred and Annette Arata. Lillian Clinkard died the next year. 274 Clarendon subsequently changed hands and, on August 26, 1965, was acquired by Chamberlayne School and Chamberlayne Junior College, which operated it as a dormitory. In June of 1965, it had acquired 278 Clarendon, which it also operated as a dormitory. Both buildings remained Chamberlayne dormitories in 1974. In February of 1976, the 274-278 Clarendon Trust filed for (and subsequently received) permission to legalize of the occupancy of 274 Clarendon as ten apartments (which they indicated was the existing condition). On December 23, 1986, they converted 274 Clarendon into ten condominium units, the 274 Clarendon Condominium.